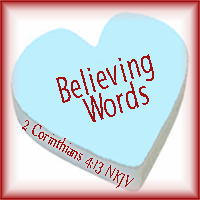 Believing words are those that are confident in the truth. They speak truth and what they have faith in. Today speak what you believe. Let your words be full of the faith that is in your heart. Dear God, As my heart believes the truth of Your word, may my mouth and tongue speak that belief to the world. For, in the sometimes unbelieving world that is all around me, I want to reflect You in all I say and do. Today, may my words reflect the belief and faith that is in my heart.